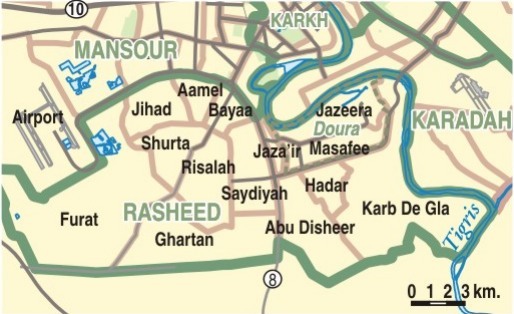 The Rasheed security district is the largest in Baghdad; bisected by Highway Eight/Hilla Road, it is split into East and West Rasheed. East Rasheed, sometimes referred to as Dora, includes the neighborhoods of Dora, Jaza’ir, Masafee, Mechanics, Hader, Siha, and Abu Disheer. It also houses an important refinery complex and power generation plant for Baghdad. Bordered to the north and east by the Tigris River, East Rasheed is lined by farm land and palm groves near the river which have served as cover for Sunni insurgents. The opening airstrike of the war, aimed at killing Saddam Hussein and decapitating the government, was launched against Dora Farms in East Rasheed. Prior to the war, the area had a mix of residents, including Sunnis, Shi’a, and a substantial Christian population. In 2006 and 2007, Al-Qaeda in Iraq developed a substantial presence in and around Dora, building fortified fighting positions, stockpiling weapons and supplies, and cleansing minority Shi’a and Christians. Abu Disheer, a neighborhood to the south of Dora along the Hillad Road, remained the only Shi’a enclave in East Rasheed, and a persistent irritant to Al-Qaeda and Sunni insurgent supply lines running from the southeastern belt into the city. West Rasheed, including the neighborhoods of Saydiyah, Aamel, Bayaa, Jihad, Furat, Risalah, and Shurta, has also been the scene of considerable violence, but the nature of the fight has been different. This area has witnessed a developing sectarian war between Jaysh al-Mahdi, al-Qaeda in Iraq, and Sunni insurgents groups for the control of key territory, including neighborhoods that control Hilla Road from the south and Route Irish from the west. Jaysh al-Mahdi and associated Shi’a extremists have been active in clearing formerly Sunni neighborhoods in West Rasheed, particularly Bayaa, Amal, and Saydiyah. Since the beginning of Operation Fardh al-Qanoon, U.S. forces in Rasheed have targeted both Sunni and Shi’a extremists, with a special emphasis on clearing Al-Qaeda in Iraq from its sanctuaries in Dora and Masafee. By doing so, they have been able to tamp down the sectarian violence in the Abu Disheer-Dora-Arab Jabour triangle, and secure East Rasheed for continuing stability operations. The Dora Market, long shuttered due to AQI influence in the area, has been open and functioning since the 2-12 Infantry cleared the area in December 2006. As summer clearing operations by Stryker infantry established security for the population in the area, the market has continued to grow. U.S. force density in West Rasheed is lower, and consequently, violence in West Rasheed has persisted even as security conditions have improved in the East. The West Rasheed neighborhood of Saydiyah has remained a persistent hotspot, perhaps because it remains mixed and it controls critical lines of communication running from the south into the city. Consequently, it is valuable territory for both Shi’a militias and Sunni insurgents. Although talks sponsored by U.S. forces have established some basis for local reconciliation, it has thus far proven difficult for the Shi’a-dominated government to accommodate the Sunni Sons of Iraq (SOI) movement in the area.